Slimshot Act Drainante Duo 1000 ml order online. Women who want to get rid of fat on the abdomen, hips, buttocks, thighs or the inside of the knees. Any person who complains about accumulation of water. Women who want to get rid of cellulite. Limiting the water retention and the formation of cellulite. To promote the elimination of toxins accumulated in the body. Back a muscular and purified body. 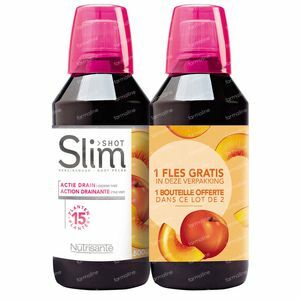 Dilute a dose of 50 ml (one full cap) per day of Slim Shot Draining in a large glass of water (250 mL). To be taken during meals. Water; peach juice concentrate (Prunus persica); Artichoke extract (Cynara scolymus): citric acid; thickener: guar gum; preservatives: sodium benzoate; Green tea extract (Camellia sinensis); Conservative: potassium sorbate; peach flavor; extract of cherry stems (sour cherry); Extract Orthosiphon (Orthosiphon aristatus); grape pomace extract (Vitis vinifera); Extract Burdock (Arctium lappa) chicory extract (Cichorium intybus) Queen extract of meadowsweet (Spiraea ulmaria); extract of blackcurrant (Ribes nigrum) extract, linden (Tilia cordata) extract of wild violets (Viola tricolor) extract of ash (Fraxinus excelsior); extract of dandelion (Taraxacum officinale); extract of heather (Calluna vulgaris); Extract hawkweed (Hieracium pilosella); sweetener sucralose.